Features Fixed, Two Column, Brown, Right Sidebar, Personal. 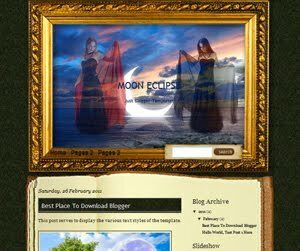 Descriptions Moon Eclipse is very unique blogger templates with design photo frame for personal blog. Dark is main color for this blogger templates but gold color make it good combination on this blogger templates. Search, classic background, and diary style for post is main feature for this blogger templates.